Total Day Protection is an every day cream to ensure the efficiency of Vita-A-Kombi range and gives added protection of SPF 10 against varying climatic changes, air conditioning, central heating and air pollution which all have adverse effects on our skin. Total Day Protection acts as a skin shield, preventing absorption of make-up and providing a perfect matt base, eliminating shine and ensuring all day freshness. 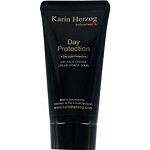 Protects and Moisturizes your skin in one treatment. Ingredients Aqua, Paraffinum Liquidum, Sesamum Indicum, Stearyl Alcohol, Polysorbate 20, Titanium Dioxide, Octylmethoxycinnamate, Tocopheryl Acetate, Parfum, Methylparaben, Propylparaben.